My wife has organized a wonderful family trip to South Africa for the last six weeks of 2008. With the high cost of airfare, it’s difficult for us to make this trip–the last time she had been able to visit was in October 2002, when Charlie was only a toddler and she was still pregnant with Suzie. This time, Charlie is 8 and Suzie is 5 and I’m able to join them, although I’ve had to work full-time while here. Still, it’s nice having the ability to travel with the family and see them every day while we’re here. Now, I’ve been to South Africa twice before, once in 1996 and again in 1998. When asked what I think of South Africa, my opinion hasn’t changed since my first visit: it is very possibly the best country on Earth to visit. This seems to surprise people, but I suspect that’s because the world at large’s opinion is based on the scare-mongering that you get from expatriate South Africans who have fled in fear. Just remember, for a country of some 47-million-plus people, the few South Africans you meet here and there in America aren’t necessarily a fair sample. As you can see, the dates are color-coded to make it easier to tell where we are and when at a glance. We’re covering a lot of ground and it’s hard to keep track, otherwise. We left New Jersey on November 19, departing from John F. Kennedy International Airport (JFK) in New York and arriving at OR Tambo International Airport (JNB) in Johannesburg, South Africa, on November 20. The flight is approximately 18 hours long including a brief one hour ground stop in Dakar, Senegal. Apparently, South African Airways will introduce a non-stop flight from JFK to JNB in May 2009, which from what I can figure, will shorten the flight to around 15 hours. Whatever the case, it’s a long time to go without a cigarette! Non-smoking international flights are a bit cruel, to say the least. As we travel around the country, we are using my in-laws, Cynthia and Graham’s, place in Victory Park, Johannesburg, as our hub. It’s a convenient distance from the airport, less than an hour drive. This is where we “come home” to throughout our trip. Cynthia and Graham generously arranged for all of us to spend a week at Kwa Maritane in Pilanesburg. Although there was a terrible fire that destroyed a significant portion of the lodge back in August, we still had a fantastic stay. The week was filled with lots of fun game drives through the park where we saw a wide range of animals: warthogs, zebras, giraffes, buffalo, wildebeast, springbok, kudu, impala, hyena, white rhino, elephant and lion. Unlike a zoo, where these animals are conveniently displayed in exhibits, a game drive is just like it sounds, where you’re driving in your car throughout the park, keeping a keen eye out for whatever wildlife you might be able to spot. What you actually see or whether you see anything at all depends on whether you can spot them in the bush. I think the kids had a great time and they’re both excellent spotters, already. Both of the girls love the water and Kwa Maritane has quite a nice pool with quite a long slide into it. The kids spent a good amount of time at the pool, enjoying the wonderful weather we had. One night, Sam and I went out for dinner to Sun City, the casino that Sol Kerzner is famous for. We decided to give the sushi at Fishmongers a try, only to discover that South African “sushi” when it comes to the actual raw fish means “salmon or tuna.” That’s it. No, I’m not kidding. It’s the culinary equivalent of putting “pasta” on the menu and actually serving Spaghetti-O’s. Now, I’m sure it’s a matter of demand, but really? Still, we had a nice time and the food was fine. After dinner, we waddled over to the actual casino area, which I almost find hard to call a casino–it’s just banks of video slot machine games. Again, having American expectations of what a “casino” should be, this isn’t it. Gambling should be somewhat social, where people play together at the same table. Simply mashing buttons on a computer, iterating the pseudo-random number generator, trying to produce a desired outcome … that’s not gambling, that’s work! Still, I managed to earn us a ten-fold return on our investment playing Fairy’s Fortune–a really fun game, I have to admit. All told, it paid for our dinner, a bunch of beers and will continue to pay for my cigarettes throughout this trip. We returned to Johannesburg–or, “Jo’burg”–for a week. This gave us the opportunity to take the kids to a few places nearby. One day, we all went to the Cradle of Humankind and took the tour through Maropeng. It’s a really nicely done tour and exhibit set, but the uber-liberal eco-faggy bent to it was a little disappointing. The excessive propaganda cheapens any actual historical or factual evidence being presented, which is a shame. The girls also went in to check out the Sterkfontein Caves, which I opted to skip–if you’ve seen one hole in the dirt, you’ve seen ’em all. Another day, we took the kids to see the South African Lipizzaners in Kyalami. Since both of the girls love horseback riding–they’ve had weekly riding lessons since they were 4 years old–seeing the Lipizzaners was great! The riders are all so friendly and chatted to us before and after the show, telling us about the various horses they have as well as answering our questions. The show explains the history of these horses and how they happened to come to South Africa from Austria, as well as the rigor of training for both the horse and the rider. The kids also had great fun feeding the horses carrots after the show, running between stables feeding their favorites. We also found time one day to visit the theme park at Gold Reef City. We saw a demonstration of traditional South African dance, both tribal and mine-worker style. Samantha wanted to take the kids on the gold mine tour, but apparently there’s some strange law–or so we were told–about not allowing children under 6 (Suzie’s only 5) under ground, so we skipped it. I would have liked to check out the Apartheid Museum, since my first experience of South Africa in 1996 was already after Mandela’s election in 1994, to see how things had been, but we opted to skip it. Maybe we can come back to check it out before we return to America. Sam’s godfather and his wife, Neil and Penny, had generously offered to let us stay with them for a week at their home in Pringle Bay, which is situated right on the beach an hour outside of Cape Town along the coast. Pringle Bay is just gorgeous. It reminds me of northern California, but much, much windier. I mean, the winds are so strong that when we took the kids to the beach, the sandblasting was so painful they said, “We don’t like the beach!” I really didn’t like it much, either–I mean, every time the wind blew, you either had to turn away from it, or end up with a faceful of sand. So, the next day, Neil and Penny took us to Lake Pippple-Popple, where the water was a deep red like Coca-Cola. The water runs down from the mountain where some plants’ roots contribute this red color to the water. It’s fresh and crystal clear, but tinted dark red. The kids enjoyed splashing around in it because it was far less windy there. One day, we travelled into Cape Town to visit Kips and Fiona and their boys. Samantha and Penny took the girls and the two older boys to the aquarium while I stayed behind to work with Kips. When they returned from the aquarium, the girls had great fun swinging on ropes hung from a very old tree in the yard. Suzie spent most of her time carrying around little Johnny–it was so very cute to see them together. Throughout the week, even dinner was fun. We collected wood from around the house for the fires that we would braai with. One night, we were treated to a chicken potjie, cooked right in the fireplace at the house. We also had a taste of fresh rock lobster caught by some kids on the beach! On the night before we left Cape Town, we had dinner at a restaurant named @365 in Pringle that was absolutely fantastic, too. Given that I “vacation with my stomach” because I love to eat, this was the first week that I truly felt like I was on holiday. Coming back to Jo’burg from the Cape, we decided to just stay around the house and take it easy. Shortly before we left for the Cape, the girls were introduced to a young boy named Joshua who lives in the same complex as Cynthia and Graham. So, when we came back, the kids all played together while we were back. Samantha and I hadn’t gotten to introducing ourselves to his mother, Janice, until now. It’s actually fortunate that we finally have, because it’s officially turned this into a business consulting trip for me. Janice owns a company named Wellness Project Management that produces and publishes health and safety information materials. She has various IT projects that she needs done and I’ll be able to help her with them remotely, once I’m back in the US. But, while I’m here, I can see what she currently has and how she does things and make some short-term recommendations and explain some long-term plans for meeting her goals. I still need to find out how I can officially form a business here in South Africa, but for now I’ve at least secured the panoptic.co.za domain name. I’ll try to open a bank account for the business and file the appropriate paperwork to register it before we leave. It would be really nice to be able to make this trip to South Africa more often and it be a business trip with respect to tax treatment. We’re spending Christmas with Samantha’s uncle Derrick and his family in Paddock which is about two hours outside of Durban. As our Christmas gift, Cynthia paid for us to take the Premier Classe train from Johannesburg to Durban overnight, where Derrick would pick us up and drive us the rest of the way to Paddock the following morning. As far as trains go, this one was deluxe. The passenger compartments were roomy and the seating was very comfortable. We shared two compartments between the four of us, which worked out really nicely. There’s a train car set up as a bar for smokers to go to while the rest of the train was non-smoking. There were two dining cars on the train where dinner and breakfast were served. It’s a really comfortable way to travel compared to driving or flying. Our only real complaint about the train trip is that it’s clearly geared towards what I’ll refer to as “fancy old people,” because the dinner meal consisted of five courses and only started at 7:00 PM! When you have two young kids with you who are usually in bed and asleep by 7:00 PM, you can see why this was an issue. Clearly, the long meal is designed to kill time on the train as there really isn’t much else to do other than eat or sleep, but it would be wise for the train operators to offer a meal option to accomodate children passengers. Our girls were falling asleep at the table by 9:00 PM and we hadn’t even been served the main entree course, yet. Still, this was only a minor detail as the trip overall was truly relaxing and enjoyable. So, that sums up what has happened so far, which, if it sounds like a lot, just realize that I’ve also been putting in full 8+ hour work days while here. Oh, did I not mention that? Yes, I’m taking advantage of the time zone difference, currently a 7 hour difference between US/Eastern (UTC-5) and SAST (UTC+2), which means working from 3pm to midnight here corresponding to 8am-5pm back in NJ. I’m sure most people think this is crazy, but I subscribe to the “work hard, play hard, no excuses” philosophy. You have to make time–find ways to make time–to do the things that matter to you. It might not be easy, but it’s certainly worth it. I’ll try to post more updates as the trip continues. If you read this far, thanks–I hope you’ve enjoyed this as much as I enjoyed writing it! I haven’t posted anything to my blog in the last 3.5 weeks. If I said “we’ve been busy” it would be an extreme understatement. 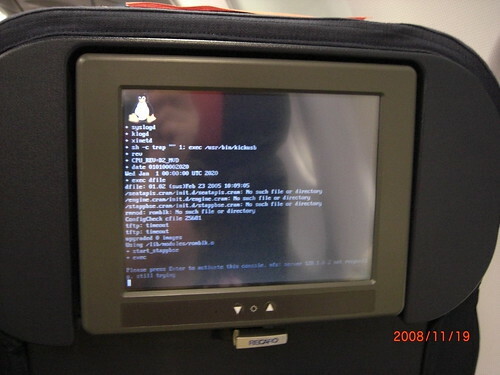 Apparently, South African Airways runs some kind of Linux for their in-flight entertainment system. Of course, on the leg of the trip from New York to Senegal, the flight staff kept rebooting the system trying to get it to work, with very little luck. Most of the time we just stared at the Linux boot process hanging, trying to talk to the NFS server. Fortunately, they got it working for the Senegal to South Africa leg of the trip. Just a quick post with a few speed tests captured at Cresta Shopping Center in Johannesburg and at Sun City near Pilanesburg. This morning I stopped into the Vodacom store in Cresta Shopping Center, where I picked up a Huawei Mobile Connect E172 USB adapter for around R2,400 (roughly USD $240) without a contract. I purchased a SIM card for another R12, and signed up for a 5GB/mo data bundle for R980. First impression: If this is 3G, then 3G just isn’t that impressive. Right from the shopping center, my speed tests were showing 82 ms pings (nice!) but only 1,075 kb/s down and 324 kb/s up. It’s very usable, but nowhere close to the “7.2 mbit/s” sales pitch of 3G. Still, the low latency makes it suitable for VoIP calling which is great. What does impress me is the fact that right now I am sitting in Pilanesburg at Kwa Maritane and I’m able to get a GPRS connection, 539 ms ping with 47 kb/s down and 28 kb/s up. I’m practically “in the middle of nowhere” and I can still get GPRS. Back in America, this would almost certainly be a dead spot with no reception at all. I’ll be here for the week, trying to survive on this slow connection–it’s okay for pushing and pulling emails without attachments and simpler web pages, but it’s going to make doing most of my work really challenging. I might have to pop down to Sun City to see if I can get better speeds to work with. Arrived in South Africa safe and sound as well as all our luggage. The kids were freaking awesome–they’re really cut out to be world travellers. I even survived the 18 hour stretch without a cigarette, without being all cranky and stuff. Tomorrow, we head into Cresta Shopping Center so I can pick up a HSPDA/3G card for my MacBook Pro and a few SIM cards for our BlackBerry phones so we can make local calls. I’m being called downstairs for dinner, but I’ll try to fill in some more details when I get a chance. 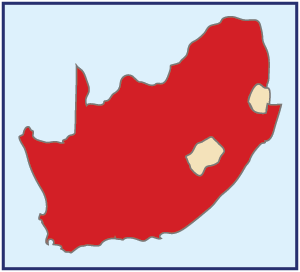 I haven’t blogged about this yet, but tonight, we leave for South Africa for six weeks. We’re taking the kids with us, and they’re going to miss a few weeks of school in exchange for what will hopefully be an invaluable learning experience. We will be visiting my spouse’s fairly large family all over the place. There will be places to go and people to see. We’ll be there through the holidays, returning in the new year. I will be online as much as I can be through various connectivity methods–it’ll be interesting to see where and how I can get connected around the country. If there are any South Africans reading this blog, feel free to share any tips or suggestions you might have. Thanks.